Vansh and my mother-in-law visited us the next morning. 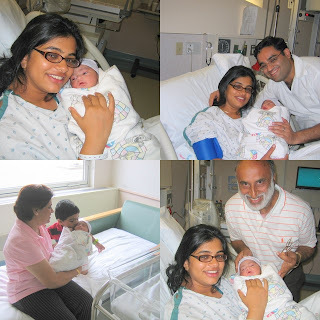 Vansh had joy and pride written large on his little face on becoming a big brother. He was scared to hold his little sister in his arms but couldn't stop kissing her when she was in one of our arms. After having shortlisted a few names like Jaina, Juhi, Bhriti and Jiya 9meaning sweetheart), we finally chose the last short and sweet one. good to see u back in action....hope ur doing well without any help...jiya is just adorable,God bless lil bro and sis.